Picking up the pieces and moving forward will be incredibly difficult for these people. Whether their homes were flooded and require extensive repairs, like one of my friends on Long Island, or their domiciles were swept away entirely in the current, it will take a lot of time, patience, and money to get back to normal. Sadly, I’m not in a position to head down there and lend a helping hand–family obligations prevent me from such–but I can’t let this go unnoticed, can’t continue on in my daily routine without doing something to help out. Monday night (October 29th), as the winds were howling outside my own windows and the trees swaying dangerously, I saw the New York City footage for the first time and I practically wept. 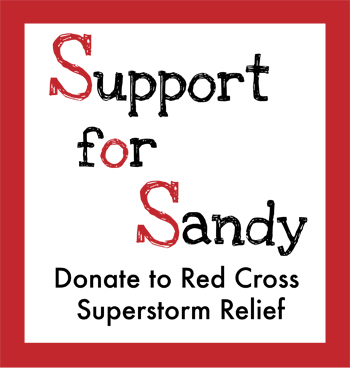 Not long after, I saw mention of a texting campaign to donate to the Red Cross–text “RedCross” to 90999 and $10 will be donated, charged on your next cell phone bill. It was a little something, but it was something all the same, and I texted immediately. So much help would be needed. I baked a Dutch Apple Crumble for our community table. It’s warm, it’s cinnamony, and it makes me think of feet kicked up in front of a fireplace, chasing away the chill in your bones after a Fall day raking leaves. Mmmm… the aroma itself is enough to improve ones spirits. Add a scoop of vanilla bean or cinnamon ice cream and you’ve gilded the lily. May those in the wake of Sandy find comfort soon. I am thinking of you–please know that you’re not alone in this. Preheat oven to 350 degrees Fahrenheit. Grease an 8-inch square baking dish (or a deep dish pie dish) and set aside. In a large mixing bowl, combine apple slices, sugars, and cinnamon, mixing well to coat the apple slices with the sugars and cinnamon. Spread in the prepared baking dish. In a medium bowl, combine flour, sugar, baking soda, and salt. Work in the butter with a pastry blender until the mixture is crumbly. 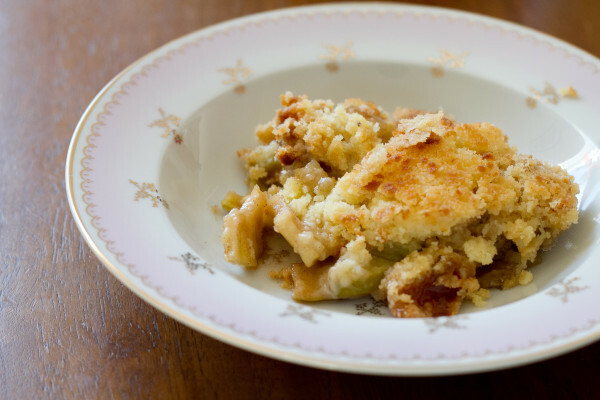 Sprinkle the crumbly topping over the apples, coating evenly, and press down gently to form a sort of crust. Bake for 35-40 minutes, or until apples are tender and filling is golden. 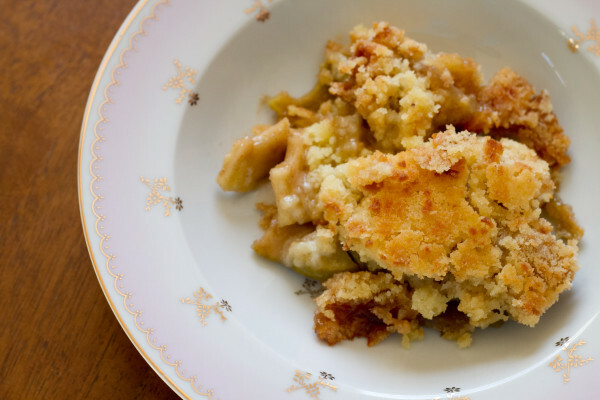 Thank you so much for participating and encouraging donations to help out hurricane Sandy relief efforts – the crumble looks wonderful! Your post was so well written and your crumble speaks to my heart. I wish I had a fire and a big bowl of it right now! Thank you! I wish I had a huge fire to gather everyone around–so many cold people right now! Unbelievable the destruction that could occur so close to home. We are not used to natural disasters up here! Yes, there was a snow storm Wednesday and Thursday, adding insult to injury. Winter is coming soon and there’s no way the cleanup will be done by then. How heartbreaking. Thank you for helping out! Ah great minds think alike! I like the sound of maple sugar in your crumble! I don’t think I can get that here but it sounds good!